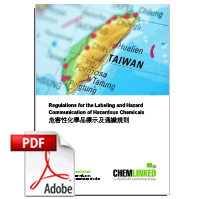 On Nov 9th, Taiwan’s Ministry of Labor (MoL) published the amendments of the Regulation of Labeling and Hazard Communication of Hazardous Chemicals (危害性化學品標示及通識規則). The updated provisions became effective immediately. However, the updated requirements of Attachment 4 (Content and Template for Safety Data Sheet) will take effect from Jan 1st, 2020. The amendments include Article 4, Article 5, Article 13, Article 18, Article 18-1, Article 23, Attachment 1 and Attachment 4.